If you’ve found yourself in the market for a new set of wheels, phil&teds strollers are not to be missed. 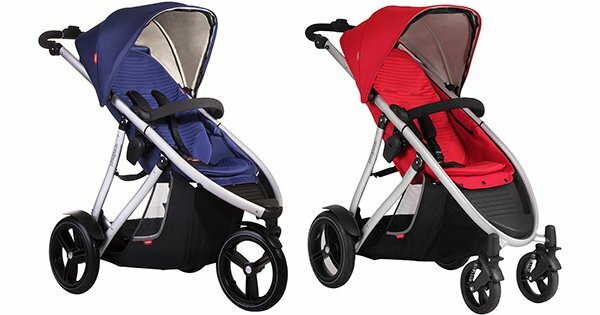 The New Zealand brand is well known for its durable, quality inline strollers with double carrying capabilities, the Vibe and Verve. 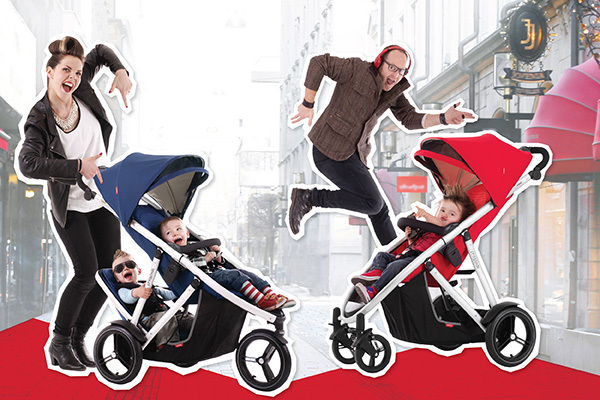 Now, to celebrate their most recent stroller design award, phil&teds are offering for a limited time a free Lazyted Bouncer with every Vibe or Verve stroller and double kit purchased from Babies ‘R’ Us! Click on through to find out more. Just what is an inline stroller? Simply put, it’s a single stroller where all extras like the double kit sit directly behind, adding no width to the frame, so parents can carry two children and continue to effortlessly push, manoeuvre through doorways and aisles along with up and down kerbs with ease. It’s easy to see why the phil&teds Verve was given the internationally renowned Red Dot award this year for such magnificent design. 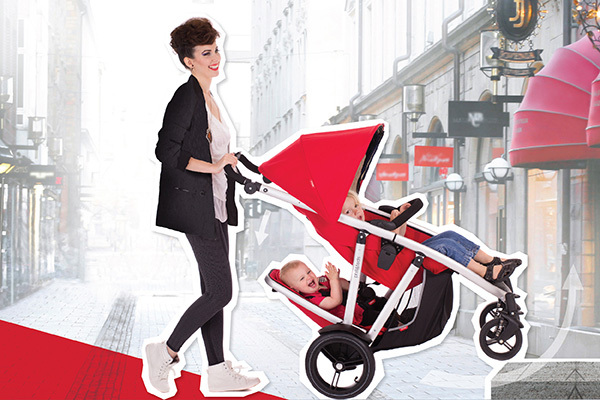 Each phil&teds’ Vibe and Verve stroller has an on-handle brake, a sleek urban aluminium frame and a super handy compact fold that’s great for parents who drive smaller cars. 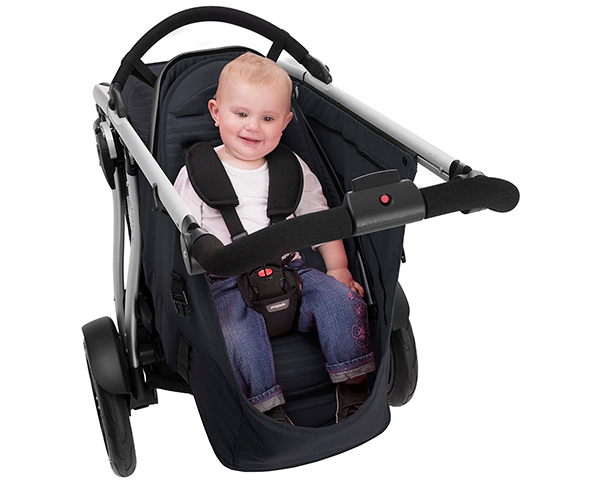 Both model strollers can comfortably fit a child of up to five years (or up to 105cm tall) in its large, plush seat. By simply adding a phil&teds Double kit, the Vibe and Verve models morph into double strollers, becoming a ride built for two (or carrying one cherub in rear facing position, as pictured below). Whether carrying two newborns or two toddlers, no configuration is too hard. In fact, there are 23 seating configuration options – including accommodating two capsules for the ultimate twin toting travel system. There’s just one difference between the phil&teds Vibe and Verve strollers. The Vibe has three 30cm air filled tyres and the Verve has two 30cm air filled tyres at the rear and two smaller 18cm tyres upfront. So the only decisions you need to make is between three or four wheels – and of course your preferred colour. Both the Vibe and Verve are available in cobalt, cherry and black. As mentioned earlier, phil&teds are giving away a free Lazyted Bouncer, valued at $99, with every Vibe ($849) or Verve ($849) stroller and Double kit ($160) when purchased together. 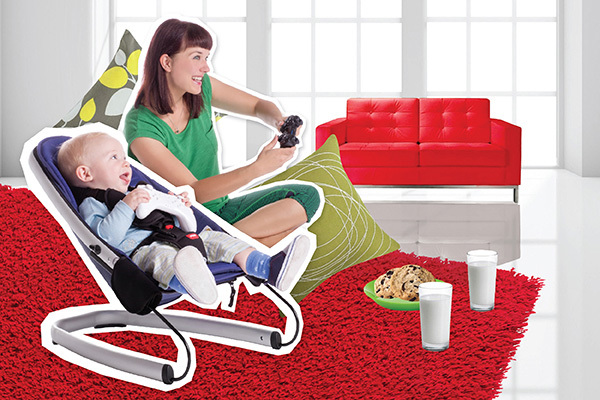 The Lazyted Bouncer is an adapter that converts your Doubles kit to a handy infant bouncer which is portable, lightweight, easy to assemble and great entertainment for baby. The Lazyted Bouncer offer is available for a limited time only from Babies ‘R’ Us, so be sure to secure your Vibe or Verve stroller and Double kit quickly.